I shed a few tears today upon hearing the news that John Stott, at the ripe age of 90, died. A leader among the British evangelical world, Stott was former rector (read ‘pastor’) of All Souls Church in London, author of some 50+ books and one of the sharpest theological minds around. He was a hero in the faith to me. His book, The Cross of Christ, was recommended by great men in my life. After reading it I could see why. The book plainly yet eruditely expounded upon the importance and centrality of the crucifixion. It has been – and likely will be – one of the greatest, most influential, books I will ever read. If you haven’t read it. Buy it today. Read it as soon as you can and be blessed by it! I had the opportunity to meet Dr. Stott when he visited Houston several years ago. A friend invited me to hear him at St. John the Divine, and I jumped at the chance. He preached a straightforward, biblically sound exposition of a specific Scriptural passage which blew me away because it was so very unspectacular. No grandiose opening illustration. No bellybusting humor. No riveting narrative. Just clear, accurate teaching from God’s word. It was refreshing and instructive for a young preacher sitting in the pew that evening. Afterward I shared a few words of gratitude with Dr. Stott. He was kind, gracious and left a lasting impression on me. Only this past May I found myself at his church, All Souls in London. I and my traveling team barely missed the evening service (they had dimissed merely a minute before). However, I counted it a privilege merely to have walked into the church building. For some reason, it felt special to have been in the same sanctuary in which a hero of mine had given his life to the preaching of God’s Word. So it is with a heavy heart and numerous tears that I grieve my British brother’s death. While I know his is a greater reward at present, Dr. John Robert Walmsley Stott will be sorely missed by many. You can certainly count me among that number. 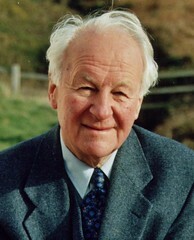 Thank you Lord for the life and ministry of John Stott.